An action game for traditional cards. 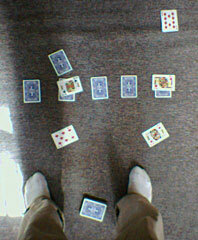 Target Practice is a fast game of throwing cards at the other player's line to score points. It provides an interesting change of pace in an evening of heavy duty strategy games. For 2 players. Now available in a book of seven original card and dice games for $10.99 at Lulu.com, or $2.99 on the Kindle.